Letter hand signed by Eddie Rickenbacker as President of Eastern Air Lines dated Fedruary 25, 1944. This historic document is over 72 years old. 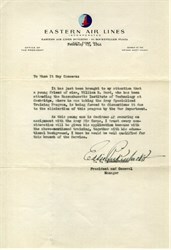 The actual document shows no discoloration with a nice bold signature of Eddie Rickenbacker. It is in fine condition but it has naturally been folded.